Are you a safety kind of person? Do you actually read the warning labels on spray paints, solvents or other chemicals? 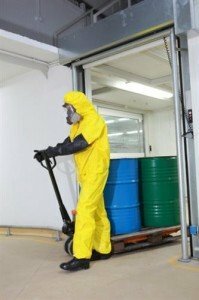 You may be just the person for a great career as a hazardous materials removal worker. When dangerous materials contaminate the environment, a structure or a roadway, they have to be removed for public safety. Materials such as lead, asbestos, arsenic, heavy metals, radioactive material or other substances that are flammable, toxic, corrosive or otherwise dangerous are removed by workers specially trained in environmental remediation. Due to the nature of this job, there is a great variety in the type of work done, so being flexible is helpful. Accurate record keeping is a must, as the results of remediation are often reported to government agencies. Some construction experience helps if containment structures need to be built. Math skills help when mixing solutions to remove or neutralize hazardous waste. Above all else, attention to detail and personal and crew safety are paramount. By following specific instructions, hazardous waste removal workers have a lower than average injury rate at work. Asbestos abatement workers and lead abatement workers remove lead and asbestos from older buildings in a safe and contained manner, often requiring sealing the building and using respirators for worker safety. Decommissioning and decontamination workers clean and decontaminate facilities being decommissioned of radioactive materials. Decontamination technicians clean radioactive items, often by using remote controlled robots which also monitor the area for radioactive contamination to reduce the spread of contamination. Emergency and disaster response workers clean up hazardous materials after train or truck spills. Radiation-protection technicians locate and judge hazards from irradiated materials, run equipment for decontamination procedures and store radioactive material for transport or disposal. Treatment, storage, and disposal workers move substances and treat, store or dispose of them while following EPA or OSHA guidelines. Mold remediation is used in buildings that have excessive mold due to flooding or water leakage. Though there is no formal educational requirement beyond a high school diploma, GED or equivalent, there are certification requirements based on different jobs. A 40-hour OSHA safety course and license are often required. If there are multiple substances on one site, certifications in multiple areas ensure you can continue working. Nuclear workers have the highest training requirements, due to the material they are handling. To keep your license, continuing education must be taken every year. These classes are approved by regulatory agencies and offered by companies for their workers. A career in this field takes technical training. The basis for each area is the 40-hour OSHA Hazardous Materials coursework. A background in construction is helpful because of remediation done in structures. Workers dealing with radioactive materials are required to have an associate’s degree or two years’ work experience in the field. Many workers who don’t pursue a degree will take a janitor’s position in a nuclear facility for two years for this requirement. Positions like this include construction laborers and helpers, firefighters, insulation workers, painters, construction and maintenance, police and detectives, power plant operators, distributors and dispatchers, and water and waste water treatment plant and system operators. The median salary for this position is $37,600 for May 2010. This job is projected to increase 23% from 2010 to 2020, faster than average.